Triangular Prism is a three-dimensional solid shape that is formed by putting rectangles and triangles together. Here, we will discuss the surface area and the volume if a Triangular Prism.In the daily life, consider an example of the box sitting on the floor or everyday box is an example of Prism. 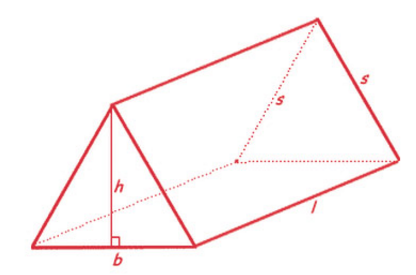 In simple words, A prism is a solid shape with two identical edges connected through two parallel lines. In most of the cases, boxes have either rectangular or square top or bottom. But imagine a box with triangular top or bottom, so how will you name it. This will be a Triangular Prism.Any prism with two parallel triangular bases and three rectangular faces then it will be named as the Triangular Prism. If you will cut the Triangular Prism into parts and put it flat on the table then you will better understand the structure of the shape. It will be divided into two rectangles and three triangles when divided properly. When 3-dimensional shaped are formed by 2-dimensional shapes then it will be named as faces. The top and bottom of the shape are still triangular bases. The three rectangles will be named as lateral faces. In this way, a triangular prism will be divided into five faces two triangular and three rectangular faces. When two faces of a Prism meet together, then it will make a line segment that is named as the edge. When edges meet together then it will make a vertex. In brief, a triangular prism always has five faces, six vertices, and the nine edges. To represent a prism, each vertex is named with a different alphabet. What are the properties of a Triangular Prism? A triangular prism when divided has five faces, two triangular and three rectangular faces. A regular triangular prism has 9 edges. It will make 5 faces. It will make 6 vertices. The properties will change for irregular or semiregular polygons. Surface area is the total space available outside of an object. For example, when you cover a box in wrapping paper, then you should know its surface area to get an idea of the actual quantity of paper. To calculate the surface area of a prism, you should divide the prism first then calculate the surface area accordingly. In net, calculate the surface area of two triangles, and three rectangular bases then add them together. There are shortcut methods too for calculating the surface area of complex figures. With a depth understanding of the concept, you can reach to a solution quickly without any confusion. The volume of a three-dimensional shape is the totals space occupied within the object and it is given as the product of base area and height of the prism. Thus, with depth understanding of Formulas, this is easy for you to understand the prism and solve most complex formulas too.